You may un GenoPro on Linux using the Wine emulator. While it is out of the scope of this document and because so many versions and tweaks of Wine exist, we will not show you how to install and configure it. However, many resources are available online to help you, starting with the official Wine Website, Wine HQ. Most recent desktop Linux systems show a graphical interface upon bootup, however it might not be the case for you. 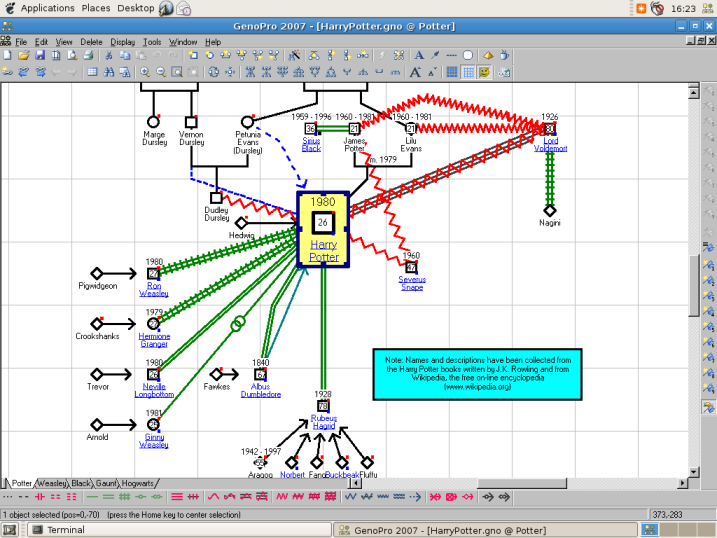 Wine, as well as GenoPro, are graphical applications that will not work on a text-only console! Issue the command startx to start XWindows. Just like Wine, it is unfortunately out of the scope of this page to explain how to install / run and/or configure XWindows. It comes standard with most Linux distributions, but it might not be installed on your computer. Please refer to the official XWindows Website or to your Linux documentation for more help. GenoPro relies on libraries that come standard in most versions of Microsoft Windows operating system, but not on Wine. We have packaged the required files that you will need to install prior to running GenoPro. Be aware that file names in Linux are case-sensitive. Package names downloaded from the GenoPro server contain uppercase letters. Use your favorite Linux Web browser or any other available tool to download InstallMfcDLL.exe from http://www.genopro.com/InstallMfcDLL.exe We recommend downloading with Wget as it is fast and available on most base linux systems. As you have done with InstallMfcDLL.exe, you can now download InstallGenoPro.exe into the same folder. Again, point your favorite Web browser to http://www.genopro.com/InstallGenoPro.exe or download using Wget. On some Linux systems, simply double-clicking on a Microsoft Windows executable file will not launch it. If you want to make sure that your application is properly initialized, pass the application name as an argument to Wine from a terminal window. Not only this will give you more control of what happens, but precious debugging information will then be shown. A dialog box will show up asking you if you want to install the required files. Just click Yes to install them. A message will pop up when the installation is completed. a) Click on the button I accept the agreement if you agree to the License Agreement. b) Click on the Install button. Unlike on Microsoft Windows operating systems, the installer cannot add a shortcut to your Desktop or Start Menu. 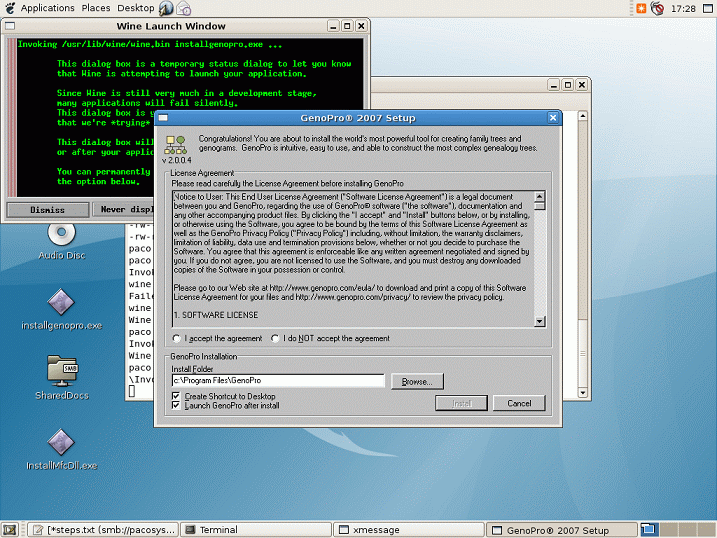 GenoPro will run by itself after the installation if you have selected the Launch GenoPro after install option. However, subsequent use of the application will require that you know exactly where GenoPro.exe is located. You do not have to re-install GenoPro everytime you want to use it! If you can not find the application GenoPro.exe try searching for it with find or consult your Wine parameters, just by typing wine without any argument and pressing the Configure Wine button once it is loaded.